Habitat : Throughout india in tropical and sub tropical hilly forests. 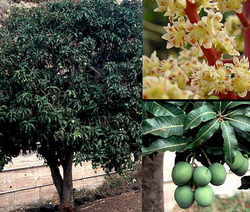 Product offered : Amra pod, Mango seed, Mango leaves, Mango bark. Uses : Fruit has a rich aromatic flavor and considered invigorating and freshening. Ripe fruits are preserved by canning, used in the manufacture of juice, squash, jams and jellies. Dried mango flowers are astringent in nature. It is also used for diarrhoea, chronic dysentery and catarrh of the bladder. The seeds are used in asthma and as an astringent. The juice of unripe fruit is a restorative tonic and used in heat stroke.